Dim sum is a style of Cantonese cuisine, where small, bite-sized portions of food are served, just like tapas. It is usually eaten in the morning and traditionally the server will push out a metal cart, with steamer baskets or small plates of food on it, and patrons will order whatever they want from them. Nowadays it’s a lot easier as we can simply place our orders on the menu that’s printed on a piece of paper, pass it to the server and the server will return with our food. Beancurd roll is one of my must-order dishes whenever I have dim sum, especially the fried version. The paper-thin crisp beancurd skin is simply irresistible! Seeing that May is hosting the Best Recipes for Everyone this month, I decided to try making some to join in the fun! 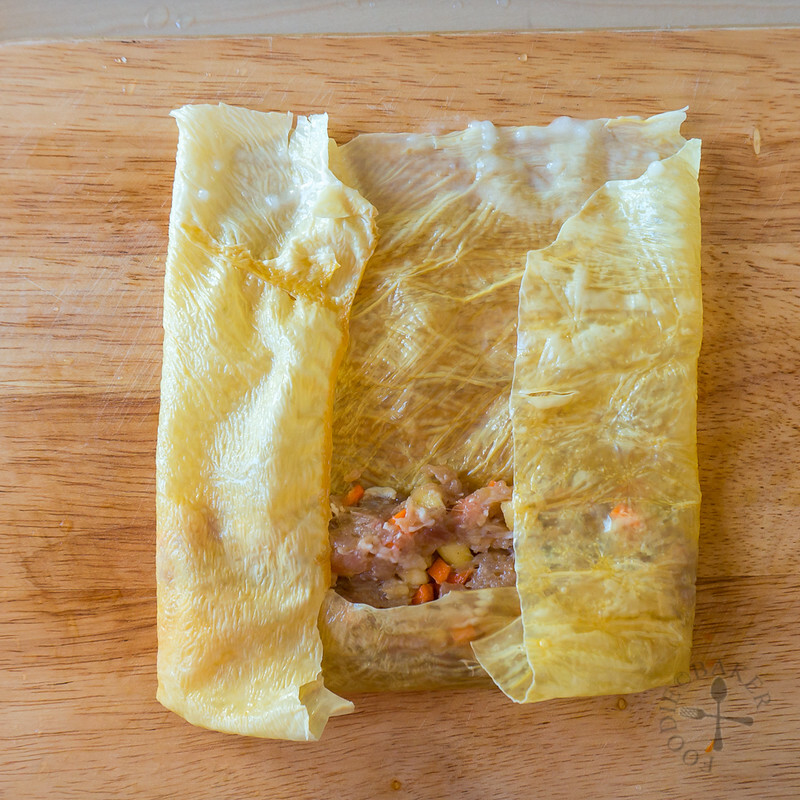 The common filling for beancurd roll is prawn and fish paste, but with the former pricey and the latter never seen before here, I decided to swap the filling with a simple meat filling. The meat of choice was ground turkey as that was what I had on hand (ground chicken may be used also). I added carrot for colour and apple for… no reason, purely because the apple has been staying in the pantry for too long. I thought the apple would add some crunch to the filling but it softened during the cooking and its sweetness wasn’t very noticeable, so it may be omitted if you don’t have apple on hand. 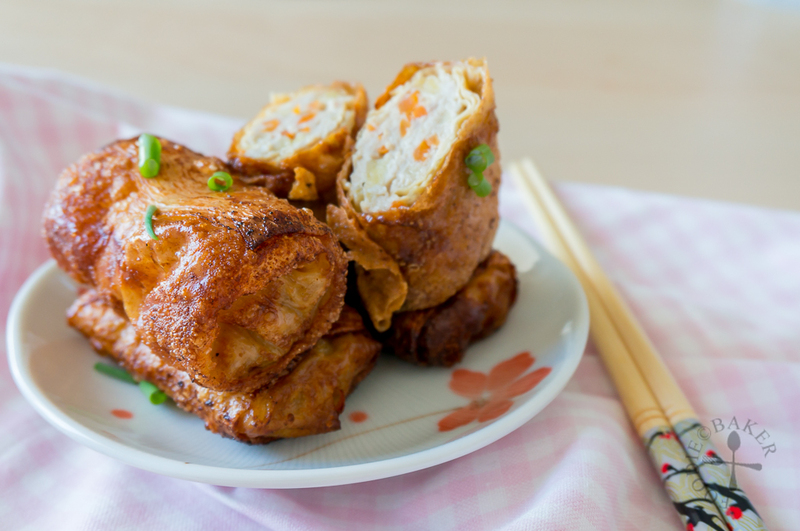 I love the resulting beancurd roll as it’s crispy on the outside, but light and juicy on the inside. It did tasted a little like ngoh hiang, which is a Hokkien and Teochew delicacy made by wrapping a meat-based filling with beancurd skin and deep-fried but sans the the five-spice powder. Both are delicious and I’ll definitely be making it again as the variations are endless! 1) Combine minced meat, apple and carrot together with the seasonings. 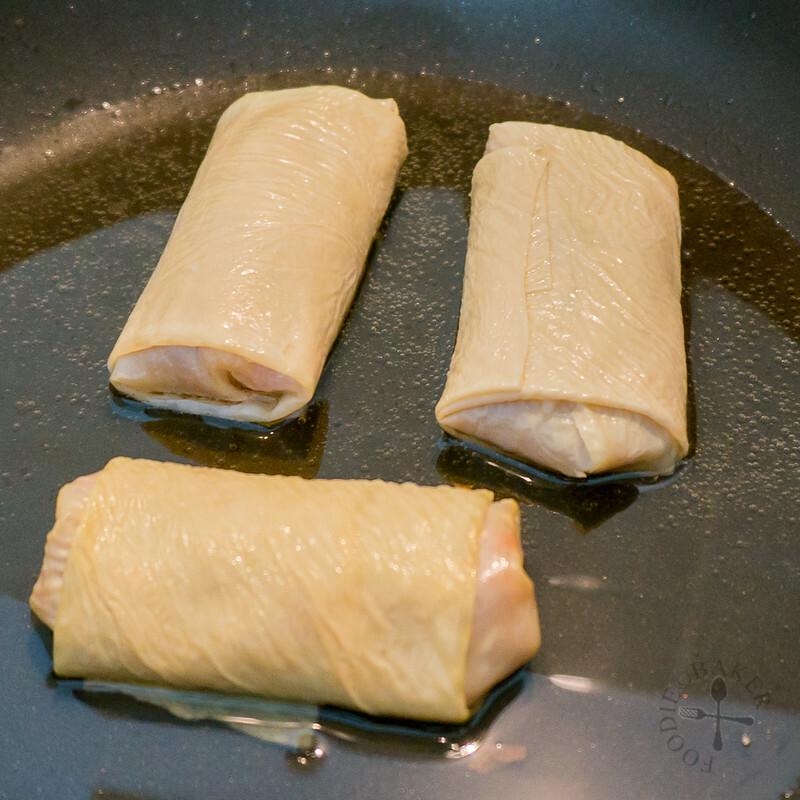 2) Soak the beancurd skins until soft. Trim them to A5 size. 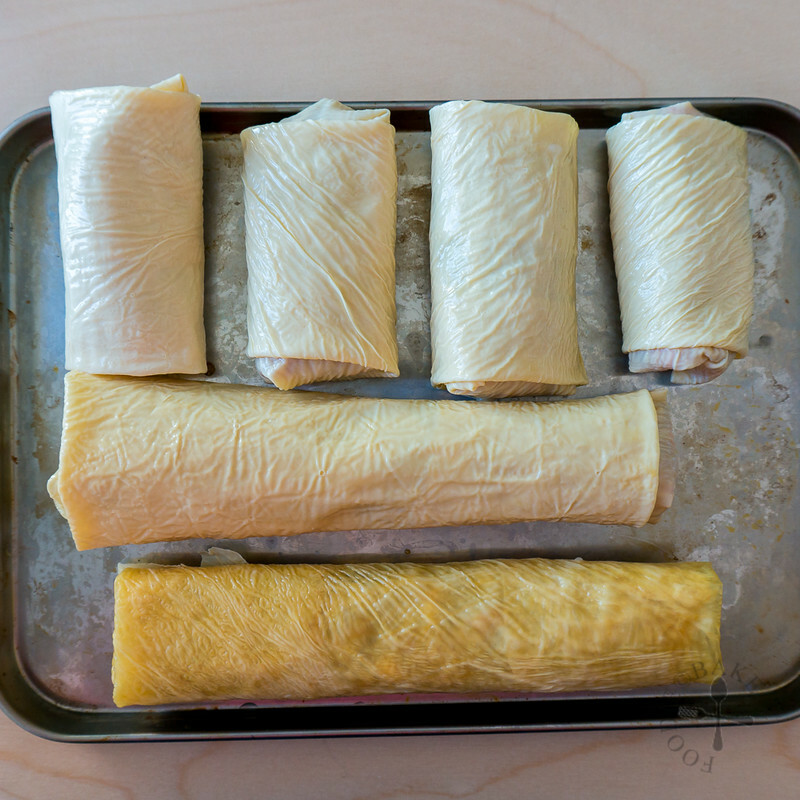 3) Wipe the beancurd skin dry with a tea towel and place the filling along on one end. 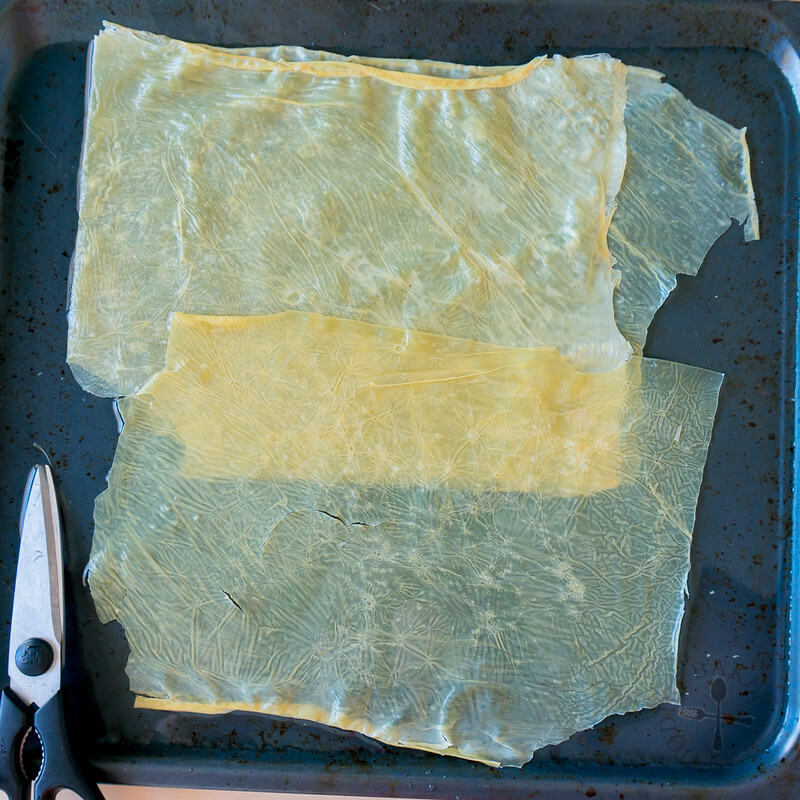 4) Dampen the edges with a cornstarch glue and roll it up. 5) Repeat until all the filling is used up. 6) Pan-fry or deep-fry the rolls until golden-brown on all sides. 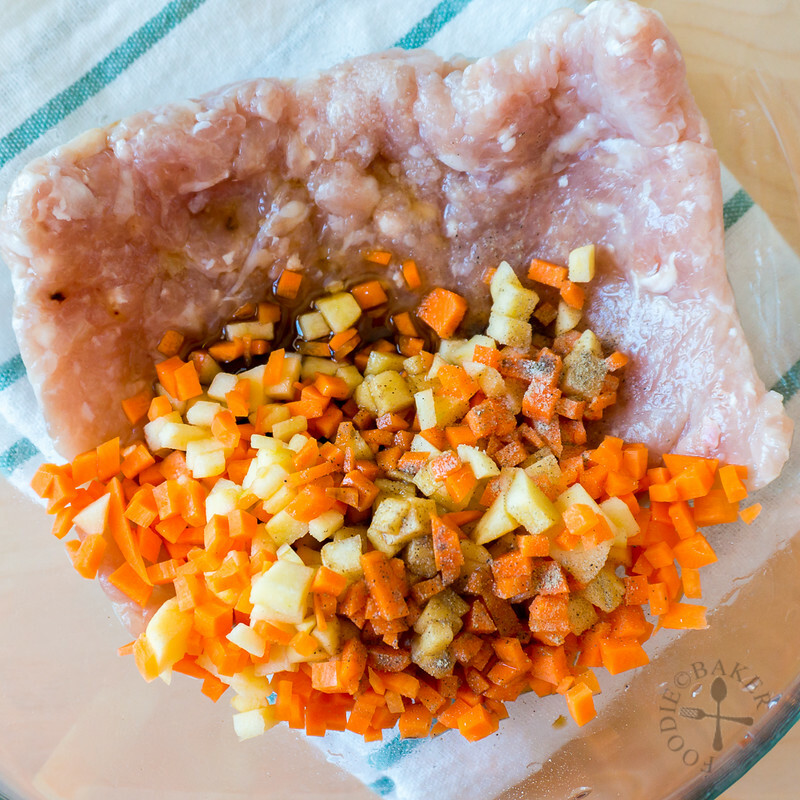 Combine minced turkey, apple, carrot, soy sauce, sesame oil and white pepper together. Set aside for 30 minutes to marinate. Soak the dried beancurd sheets in room temperature water until softened. Trim the beancurd sheets into A5-size to get 8 pieces. Wipe the beancurd sheets dry with a tea towel. 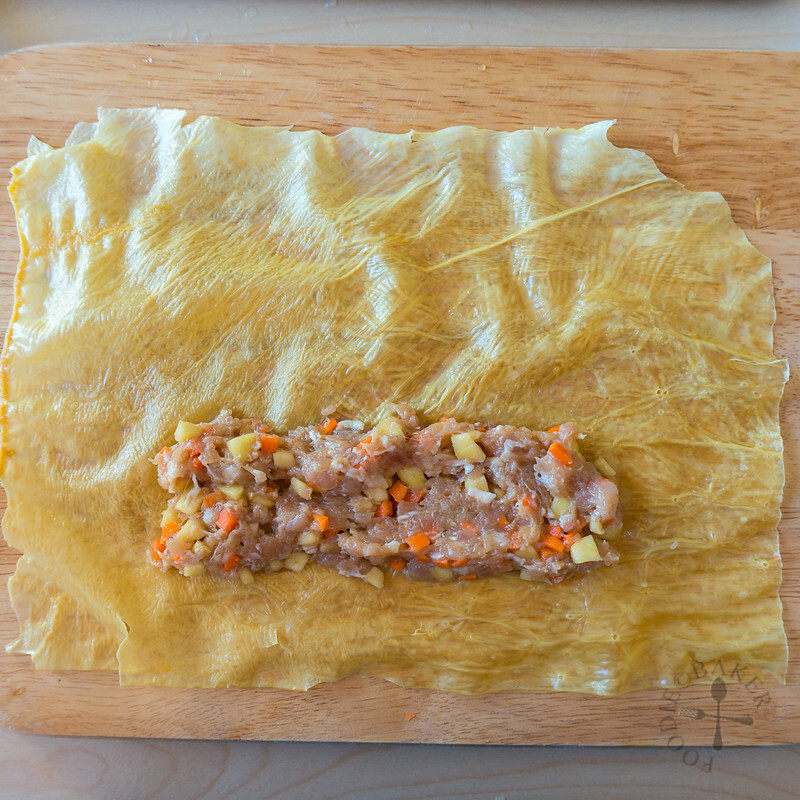 Spread ⅛ of the meat filling onto a beancurd sheet. Dab the edges with water and roll up the beancurd sheet to seal in the filling. Repeat until all the filling is used up. 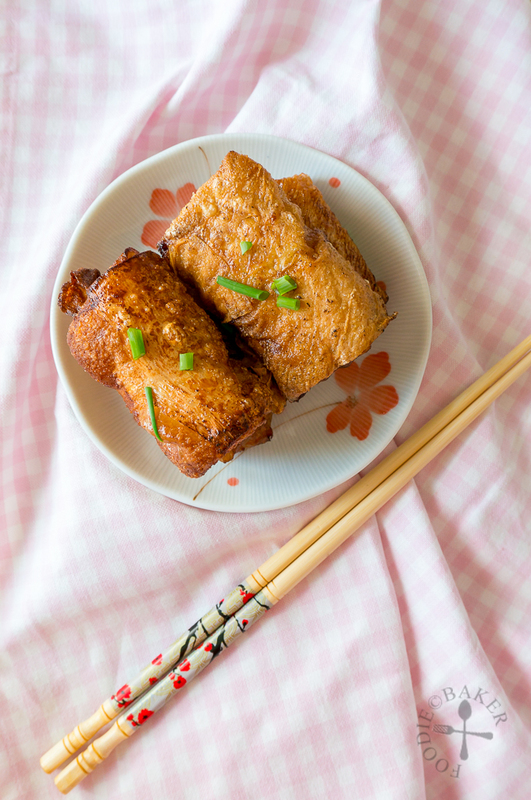 Heat oil and pan-fry or deep-fry the beancurd rolls until the skin is crispy and the filling is cooked. Serve immediately. Very yummy! It looks so crispy and delicious! 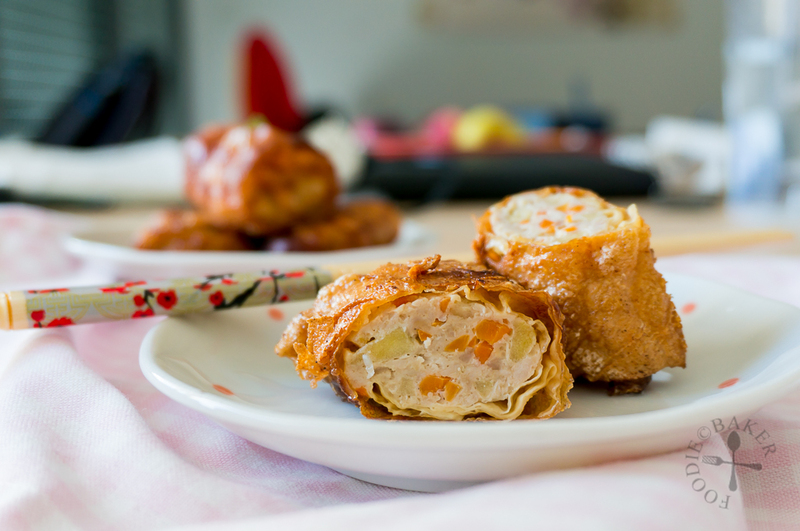 Bean Curd rolls are something I have never tried. They look delicious, Jasline! I don’t know if I have ever had bean curd skin before it but I need to try it those rolls look amazing. Simply damn delicious n beautifull beancurn roll!!! Simply damn delicious n beautifull beancurd roll !!! 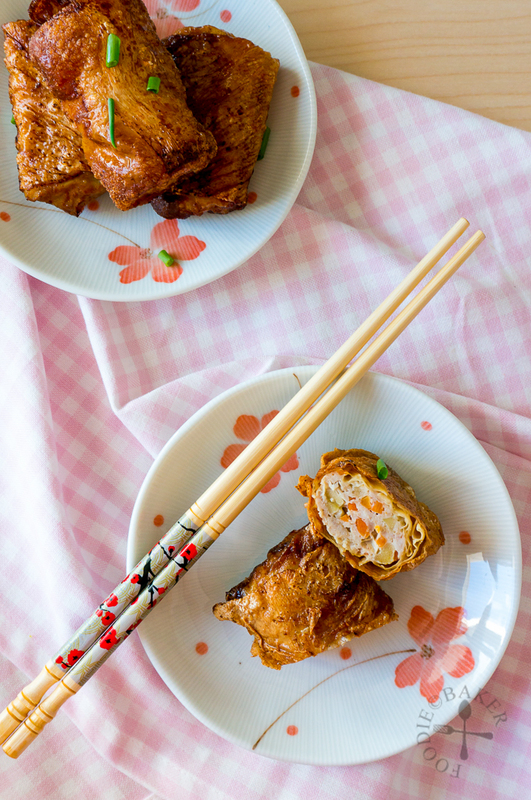 I am so glad you posted this recipe as I just purchased some dried tofu bean curd from the wet market and was wondering what I was going to make next. I love the addition of carrot and apple slightly sweet and delicious. Have a super weekend Jasline! Doing a little Facebook share! !